Agfa Billy Record is a series of medium format film folding camera made by Agfa and produced between 1933-49. Billy record cameras were listed in catalogs by lens openings as models 8.8, 7.7, 6.3 and 4.5. The names are based on the maximum lens opening. The basic body is the same for 8.8, 7.7 and 6.3 models. The 4.5 model uses the body style of the Agfa Billy Compur. 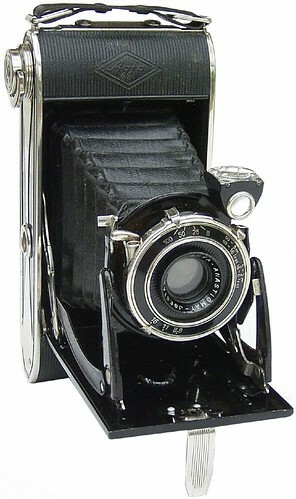 All models use 120 roll film for 6x9cm frames. The lens is Agfa Anastigmat Igestar in Automat shutter in 8.8, 7.7 and 6.3 models. There are some cosmetic variations, like chrome decors, during their production period. The camera was succeeded by the Agfa Billy Record II. Shutter: Agfa Automat, speeds 1/25 - 1/100 sec. The 6.3 model was also available in 1948 and sold in the USA and UK as Speedex Record. It has Igestar 100mm f/6.3 lens in Prontor shutter. It is like the Billy Compur but without the Compur shutter. Strut style is also like Billy Compur. Later Apotar lens in Prontor-S shutter with speeds 1-1/300 +B. "Made in Germany" stamped below the Agfa logo. ↑ models and info are from McKeown's p.19.